AS HOMO SAPIENS settles, criss-crosses and harvests ever larger swathes of the Earth, other species are being squeezed. Barely a sixth of the planet’s surface remains free of mankind’s footprint. And climate change is altering even those habitats on which people do not directly trample. Since humanity started burning fossil fuels and belching greenhouse gases into the atmosphere during the Industrial Revolution, it has caused the planet to warm by 1°C. Countries’ current climate pledges would increase temperatures by another 2°C and could destroy virtually all coral reefs, and halve the geographic range of half of all insect varieties, nearly as many plant ones and a quarter of vertebrates. Like the species they try to preserve, how should conservationists adapt their practices to a changing planet—and tight budgets? Conservation used to be simpler. In principle, a parcel of land or ocean containing species of interest could be cordoned off with a physical fence or legislation, and people kept out. Today such areas cover 15% of the world’s land and 6% of the ocean. But formal protection is no panacea. A third of all protected areas carry a human footprint at least as deep as that of pastureland; ��paper parks”, existing in name only, abound. The most pristine reserves are often in places so remote that formal safeguards make little practical difference since people have no reason to exploit them in the first place. Plenty cover arid, mountainous wilderness that is spectacular but inhospitable to life. Most conservationists back the demands of the UN Convention on Biodiversity, that 17% of land and 10% of ocean should be protected by 2020, and even urge more ambitious future targets. But they are thinking anew about where to act and what to conserve. 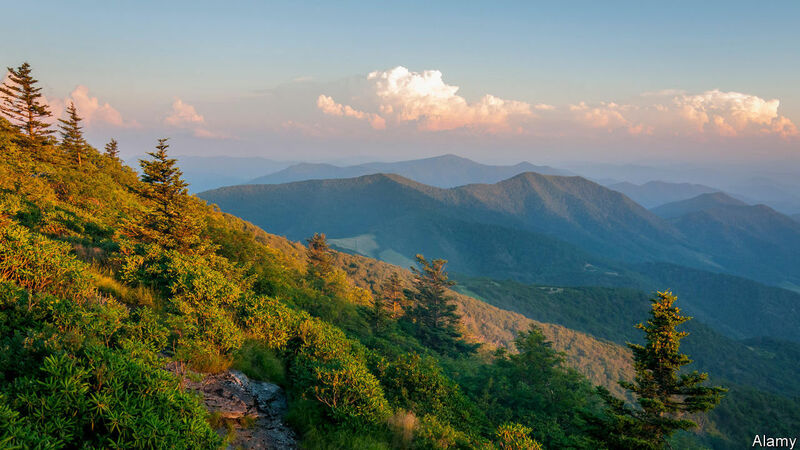 Some scientists favour the pinpointing of “biodiversity hotspots” that are particularly rich in their variety of species—places such as the underprotected southern Appalachians (pictured) in the United States and the Atlantic rainforest that hugs Brazil’s south-eastern coast and enjoys less protection than the Amazon. Others are garnering evidence on what conservation measures work on the ground, rather than relying on the gut feelings that have long dominated the field, such as marking birds’ nests to protect them during harvest, a practice that has been found in one study to be ineffective or outright harmful. A growing number look at the cost of interventions: a study published recently in the journal Science showed that the $500m or so that the American government spends annually on conservation could pay fully for the protection of around 1,300 of the 1,500-odd animals and plants listed under the Endangered Species Act if the money were allocated on the basis of species maintained per dollar. Instead, around 140 species between them get perhaps $150m more than the United States Fish and Wildlife Service actually recommends, leaving the protection of the rest underfunded, often grossly so. The bull trout, for example, gets 16 times the recommended amount of cash; the black clubshell mussel gets one-sixteenth. Of course, people care more for some species, especially charismatic ones like the bald eagle, than for others. Splurging on iconic creatures helps protect others that co-habit their realm; by happy coincidence, the beloved giant panda lives in a biodiverse part of China. But spending on species near extinction risks wasting money if they should perish regardless. As elsewhere in science failures can be instructive. Still, tree-huggers instinctively averse to talk of “return on investment” or “cost-benefit analysis” appear increasingly endangered. Next PostNext What would a no-deal Brexit mean for immigration?